Evelina made breakfast as Jane McHanna, usually in the kitchen preparing coffee and the morning meal, was ailing. Evelina stayed in the cook room for much of the day, “scalding my barbaries” to be put away. Barberry was a common, woody, hedge shrub with a couple of domestic applications. Cultivated in the 17th, 18th and early 19th centuries, the fruit made “an agreeable, refreshing jelly,”** and the stems could also be used to make a yellow dye. Evelina wouldn’t have needed the dye; she bought all her textiles. But she used the fruit for jelly and pies. Once Evelina got out of the kitchen, she picked up a paint brush to freshen up some mustard boxes. These were small to medium-sized wooden boxes for her pantry. Spices and other kitchen ingredients would have been stored in them. Evelina seemed to be getting her kitchen in perfect order for the Thanksgiving rush. 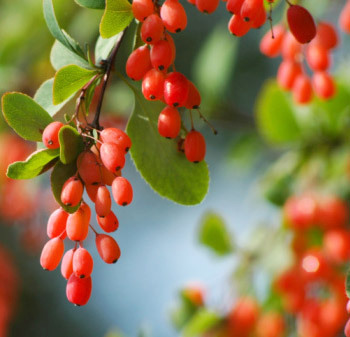 As I recall, barberries are a decent source of Vitamin C. My question remains as to how they acquired the bushels of barberries referenced in an earlier entry. As far as I know, they are pretty much an untapped resource, now.